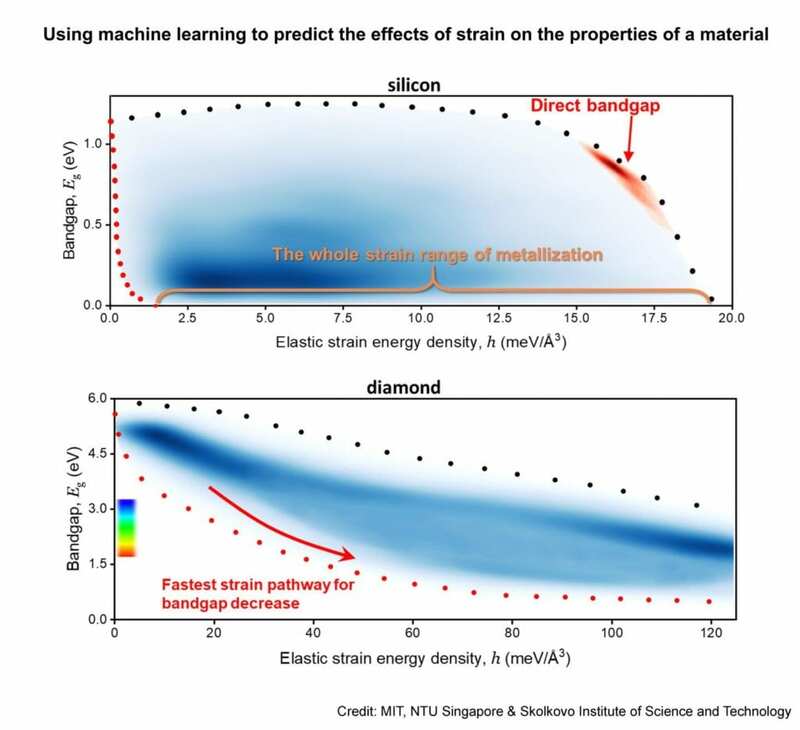 In a paper published today (12 Feb) in the Proceedings of the National Academy of Sciences, the authors demonstrated their use of Artificial Intelligence to identify the most energy-efficient strain pathways that could transform diamond into more effective semiconductors. While conventional ways of altering semiconductors such as chemical doping – adding a new element to a material – could affect and change its properties permanently, the nonlinear elastic strain considered here is reversible, which means it can be applied and removed depending on need, explained Professor Ju Li, Battelle Energy Alliance Professor of Nuclear Science and Engineering and Materials Science and Engineering at MIT. However, identifying and applying the full potential of strain-engineered materials is very difficult, due to the daunting range of possibilities. Strain can be applied in any of six different and independent ways (in three different dimensions, each one of which can produce strain in-and-out or sideways), and with nearly infinite gradations of degree, so the total number of possibilities are impractical to explore simply by trial and error. “It quickly grows to 100 million calculations if we want to map out the entire elastic strain space,” says Prof Li, who is also a Professor of Materials Science and Engineering. The work was undertaken by a multidisciplinary research team comprising Prof Subra Suresh from NTU; MIT Prof Ju Li, MIT principal research scientist and NTU Visiting Professor Dr Ming Dao, and graduate student Zhe Shi from MIT; as well as Evgeni Tsymbalov and Alexander Shapeev from the Skolkovo Institute of Science and Technology. The work points to potential new opportunities to create materials for electronic, optoelectronic, and photonic devices that could find uses for communications, information processing, and energy applications.